with his students of Girls Inc. in Lynn, MA. BEVERLY, Mass – Even as a student at Harvard Business School and a business consultant after graduation, Greg Coles’ first love has always been singing, drumming and dancing. “I can’t remember a time in my life when I wasn’t dancing,” he said. On Saturday, Oct 8th the 50-year-old dance instructor will be teaching an African Dance workshop at Endicott College and is bringing his drums. The workshop is part of a test run for introducing an African dance course at Endicott in the near future. “It’s still in the works,” said Nicole Sao Pedro, 28, Coordinator of Dance and Head coach of the Dance Team at Endicott. “But this workshop is for students to be introduced to African dance, to more cultural dance. While attendance of these workshops is required for Endicott’s dance students, Saturday’s event is open to the public for a $5 fee and dancers of all levels and abilities are welcome. Last month the Performing Arts Center at Endicott offered a workshop in Bollywood dance with teachers from the Navarasa Dance Theater in Somerville, and in the past has hosted ballet workshops with instructors from the Boston Ballet School. “Every semester we do workshops in genres we don’t offer here,” said Sao Pedro. Coles has been teaching dance, drum and singing since 1997 to students of all ages and backgrounds at schools, athletic clubs, restaurants and churches. He currently teaches part time at both Tufts University and Salem State and also offers adult Latin dance classes at Beverly Athletic Club. His weekly schedule includes Latin and Salsa dancing at Rockafellas Restaurant in Salem. Born in New York and raised in Connecticut, Coles began dancing and singing when he was a child and joined his first professional group at age 12. Though he worked as a business consultant after leaving graduate school, he said he was snapped back into the artist industry. “I found myself dancing with beginners and showing them how to do the moves,” he said. Soon, found himself teaching as a career. 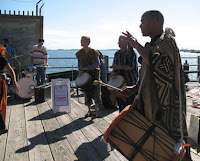 Coles’ interest in African drumming and dancing began at Harvard when he met Sidi Mohamed “Joh” Camara, a drummer and dancer from Mali, West Africa, who was teaching at Harvard and other Boston schools. Hearing Coles play, Camara asked him to join his company, Troup Sewa. “Then, every day, I was drumming in Cambridge,” Coles said. Camara currently resides in Boston where he teaches a semester dance and drumming class at both Boston University and Harvard University. Though Coles now lives in Marblehead, he and his old teacher still maintain contact. “I’ll go to Cambridge and drum for his class, and he’ll come to mine here,” Coles said. Coles' enthusiasm for African drumming and moving started at Harvard when he met Sidi Mohamed ?Joh? Camara, a drummer and artist from Mali, West Africa, who was instructing at Harvard and other Boston schools. Not being able to identify a person on the streets is a national security threat. I have really enjoyed reading through this post. For sure it is a post that is worthwhile reading. I have a great desire to learn about African Dancing and Drumming. I will keep on visiting your site for some more information in future. If Statement of purpose writing service is what you have been looking for, then you can liaise with us for the best help. skype probably is the only software from Microsoft which Mac users seem to like a lot for the ease it provides in making audio/video calls and sharing files, watching videos and do a lot more. I have had a great deal of gather in the wake of watching this article from you! I feel it intriguing, your post gave me another viewpoint! I have perused numerous different articles about a similar subject, however your article persuaded me! I trust you keep on having superb articles like this to impart to everyone! There are many new ringtones on our website. Please click to download to your computer. Magic Server is one of the amazing private server because of its reliability which enables you to play with no uptime. In the this private server, there are clash of magic s1, s2, s3 and s4.